No matter how much we learn and try to be better people, humans beings often end up making the same mistakes and fall into the same holes repeatedly. We can try our whole lives to be the moral and good-hearted people we possibly know, yet we will often fall prey to pride, envy, lust or especially greed. Because there is always room for more. Have you ever wanted something so bad that you’d be willing to do anything to get it? That’s being greedy, even if you have a good reason to do so. Granted, most people feel this way when they’re young and desire a new toy or their favorite box of cereal, even though their mother says it’s bad for them. What if you were an American living in 1920s Mexico, shortly after the Mexican Revolution, and you have little more than the clothes on your back? This is the dilemma in John Huston’s 1948 film “The Treasure Of The Sierra Madre.” A film that is told more in the style of a Joseph Conrad novel, where each scene acts as a small adventure that adds to a larger scale of the world these characters inhabit, all while we watch their humanity and souls get devoured by greed and paranoia. The film starts in a bustling Mexican city, where Fred C. Dobbs (Humphrey Bogart) asks every American he can find to pay for his next meal, which ends up being the same guy three different times. Dobbs uses the money to buy a trip to the barber shop and as much whiskey as he can get his hands on. 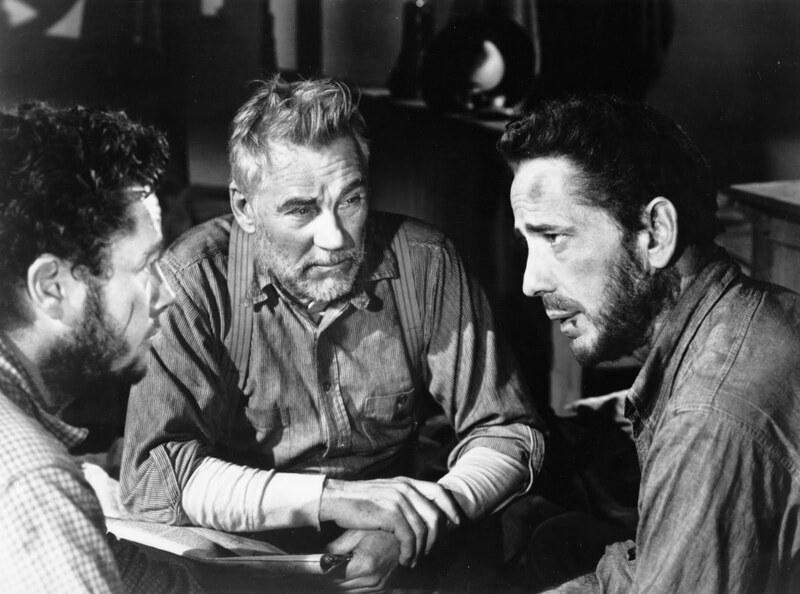 By the end of the day, he’s flat broke again and finds Curtin (Tim Holt) at a homeless shelter, where the two meet Howard (Walter Huston), a grizzled old prospector itching to go out exploring for gold, as he goes on about why gold is so valuable. Dobbs and Curtin discuss what Howard had to say, that gold will make good men do evil things. “I know what gold does to men’s souls,” says Howard. But the two men agree that it couldn’t be true for everyone. That it all depends on the type of person and how greedy they are. The next day, Dobbs and Curtin find work helping a “wealthy” Texan build houses. When it comes time for the Texan to pay up, he bails out and refuses to pay a cent to anyone. Dobbs and Curtin find this man in a bar and beat him to within an inch of his life to get the money that was coming to them. All this time, the words of how avarice only affects certain men running through our minds, as Dobbs and Curtin nearly kill a man to get their money. And yet, the fascinating part is that we can’t really blame them. They spent almost a month building houses in the hot Mexican heat, sometimes working twenty hours a day, and had nothing to show for it. Shortly after that, Dobbs and Curtin find Howard and agree to use their money on something useful – going into the mountains to find gold. The three put up all of their money to buy the necessary supplies, food, water, mules and guns to go hunting for the treasure of a lifetime in the high mountains of the Mexican terrain. At the beginning of the film, Fred Dobbs seems like a guy trying to make a living in a difficult situation, being stuck in a foreign land with no money. Dobbs says that he won’t need much money out of this trip and he’d be okay with getting $10,000. It isn’t until the signs of gold start to appear that Dobbs takes a turn for the worst. After their first full day of work, he immediately asks to start splitting the gold into three even piles, and that each man should be responsible for his own stash, including hiding it from the other two. “This is the country where the nuggets of gold are just crying out for you to take them out of the ground and make ’em shine in coins on the fingers and necks of swell dames,” says Dobbs. When Curtin accidentally stumbles across Dobbs’ hiding spot, Dobbs nearly shoots Curtin for stealing, even though Curtin was only interested in killing the Gila Monster that had crawled under that rock. Even after learning the truth, Dobbs still wants to beat up Curtin for even thinking about going near his money. Though Curtin saved Dobbs’ life earlier from a cave-in, and Howards’ knowledge of the area being the only thing that got him to this mountain, Dobbs refuses to trust anyone. The man that was relatable at the beginning of the movie has turned into a twisted greedy and sort of evil caricature of his former self. “I think I’ll go to sleep and dream about piles of gold getting bigger and bigger and bigger,” says Dobbs. The thing that suddenly makes “The Treasure Of The Sierra Madre” scary and intense is that Dobbs’ transformation into this monster is realistic and feels like it could happen to anyone if they were put in similar situations. Separated from society, collecting thousands of dollars every day, with two other people as your companions, but also their own self-interests. What do you do? 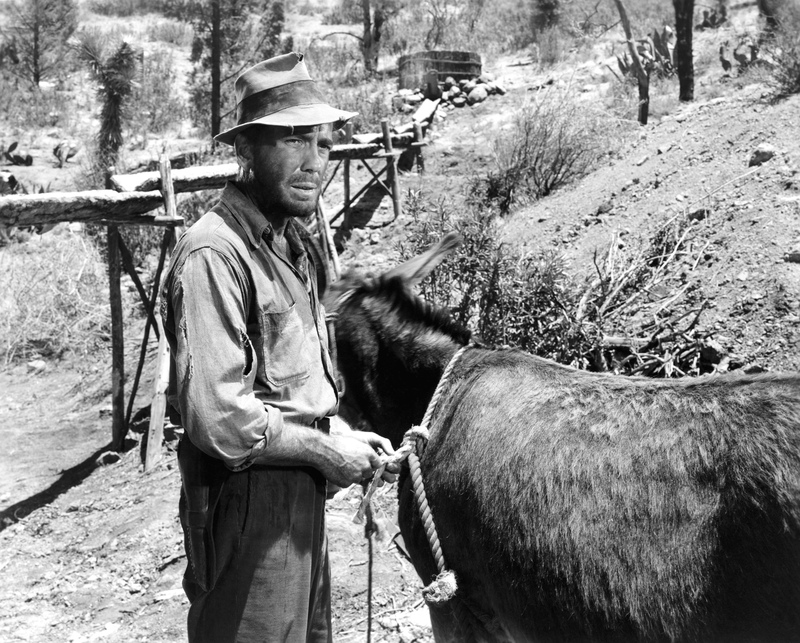 “The Treasure Of The Sierra Madre” offers three answers to this question with the main characters. Dobbs has become nothing but greed, to the point of risking all of his money to see if Curtin would fall asleep before him. Always wanting more and insisting on lavish rewards when he returns to society. Curtin, however, is kind and logical about all of this. He was the only one to oppose splitting up the gold at the end of each day, because he didn’t see the point in it. Curtin also risks his life several times to protect others instead of his interests. He doesn’t mind if the trip takes a little while longer and if he has to deal with a paranoid partner, as long as he gets what is coming to him. Howard is the middle man who sees both sides of argument, because he has been there. He has been Dobbs, never satisfied with the gold he has and always hankering for the chance to get more. But he has also seen gold destroy his friends and has probably done so a few times himself. He’s experienced those hardships and has come out stronger. Yet all three men remain believable. The audience relates to Curtin for remaining calm in this situation, respects Howard’s knowledge and fears what might become of Dobbs. I would say we’re supposed to pity Dobbs for how selfish and pathetic he could be, especially near the end, if Dobbs wasn’t so undeserving of pity. The scene that personifies this feeling is when one of the three gold hunters must to go into a nearby town for supplies, but none of them are willing to go, especially Dobbs. He’s afraid that if he goes, this will give the other two ample time to find his stash of gold. Howard points out that he should take his gold with him then, but then Dobbs becomes paranoid about the lurking murderous bandits nearby and that the gold would only give them more of a reason to rob him. “If you was to run into bandits, you’d be out of luck anyway. They’d kill you for the shoes on your feet,” says Howard. By the end of the film, Dobbs reflects on some of the terrible actions he has done to get the gold that he feels rightfully belongs to him, leading to a soliloquy that is still haunting today as it was in 1948. 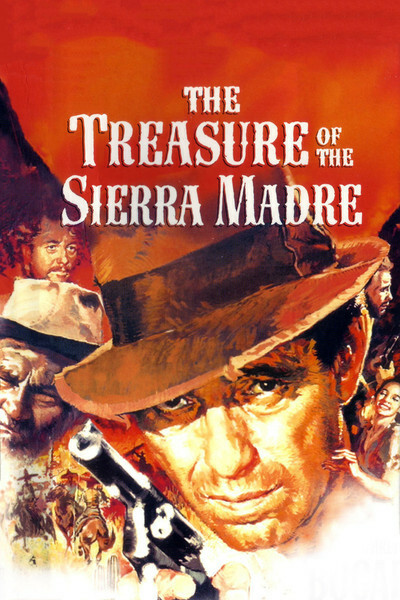 “The Treasure Of The Sierra Made” had many complications while being filmed. 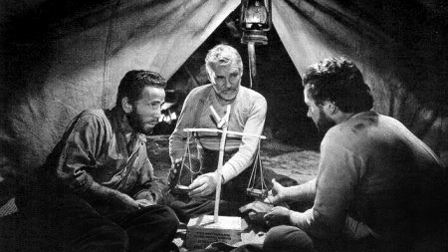 Originally an idea John Huston wanted to film in 1941, based on the novel by B. Traven, Huston waited until after World War II and filmed it deep in the jungles of Mexico, during the middle of the summer, and still went massively over-budget and took longer to film than expected. 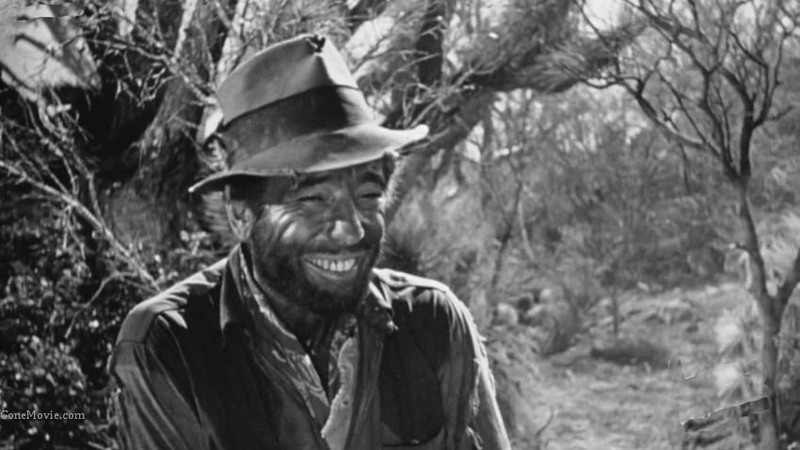 While it took more than seven years to make “The Treasure Of The Sierra Madre,” the result was a film with diverse yet interesting characters, a tight and focus story with a crisp and realistic approach, balanced and superb acting from the three main cast members and a message that spoke directly to the human condition of greed and paranoia. A film that wasn’t so much about gold or the adventure to the gold, but the characters who set out for a fortune and instead found hardships and tragedy. By the end of this film, we are as wise as Howard about what gold does to men’s souls.